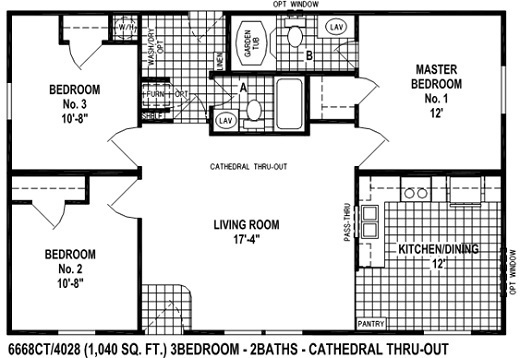 The Spring View Select 6668CT Mobile Home Floor Plan offers 1,040 square feet of living space. It features 3 bedrooms and 2 baths but you can also convert one bedroom into a den. You can also just remove the wall in the number 2 bedroom and make it a two bedroom with a large living room. We usually recommend upgrading to the 2 x 6 walls and installing the thermal-pane window as well as the insulation package. It is totally your choice of course but there are many things that we will recommend that will give great value and savings for years to come. If you have any questions, "Ask Lance" on our contact form below.